The Games server, accessed with /games, is a specialised server which is part of the Empire Minecraft network. 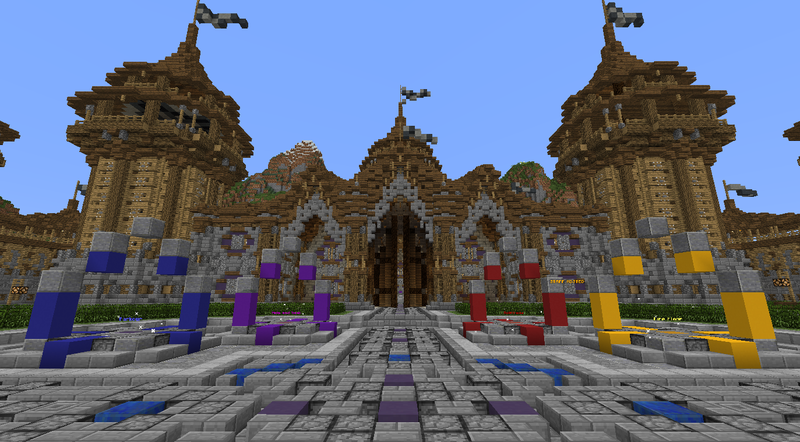 While the SMP and Utopia servers emphasise Town and survival gameplay, the games server lets players enjoy short rounds of various mini-game modes, such as PvP. Additionally, it's arenas host stuff-run and scheduled events, such Mob Arena. These take place on maps unique to the EMC network. The various game-modes that the Games server has to offer are highlighted in each of the pages to the right. Initial production began in June 2014 by the newly formed Build Team, and after a development and further design period led by the Team’s leader, B4DMAN5IMON, the project is scheduled to be released in August 2017. The Games server can be accessed from any world on any server with the /games command. If you are on the Games server and wish to return to its main lobby, in most places you can use the Commands /lobby or /town or the teleportation portals provided. If you get stuck, reconnecting should fix it, but if it doesn’t then please contact Staff. Because of its specialised status, certain EMC features are disabled on Games, or are only usable in certain areas (such as in Mob Arena and SMP PvP arenas, where you can Vault kits from SMPs). The Group, Trade, Mail, Stables and Vault systems are included in the list of limited features. Remember that it is against the rules to use exploits; if you find a bug, please report it to Developers immediately.